When compared to other published GTA games, Chinatown Wars makes no difference about the police officers; law enforcement all dress in blue LCPD uniforms. Although the maximum number of stars is still 6 (same as in other GTAs), the different DS control makes it easier for you to shake off the police – see below. How do I shake off the police? It’s never been easier – just ram them and make them crash into any of the objects around – e.g. the poles, other cars etc. One hit and their ride is over. Sure there’s a catch to it – you need to hit as many police cars as the number of police stars you have. I’ll give you an example: two stars equal ramming two police cars to get rid of one star. Isn’t that brilliant? Description: Initial heat level. Only one police car chases you. Description: Same as 1 star, more police casr start chasing you. 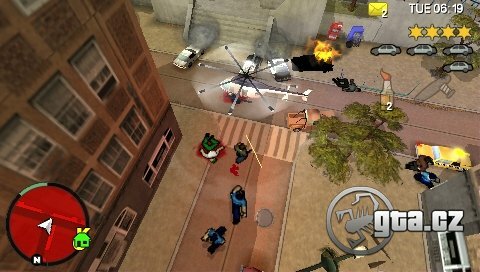 Description: SWAT gets in the game, including the chopper. Description: FBI guys enter the scene. Description : - Army and/or enhanced FBI teams start spawning everywhere. If you are willing to help me with this article or you’ve made it through the 6-star heat level, contact me at czech.gta@gmail.com.